Spring has sprung and it would seem I have a budding ornithologist who endlessly pesters me for the names of birds (I tried saying Dave and was met with a stony expression). It is no surprise then that her favourite book of the moment is Counting Birds by Alice Melvin. We have featured the Edinburgh based illustrator before and are huge fans of her designs. This book is a rhyming tale which counts birds throughout the day. The illustrations a gorgeous and have a slightly inky feeling. It is not your standard counting book and there are birds in unusual places to spot and count. Best of all it has plenty of birdy variety from swans to chaffinches and the odd owl or two. Another beautiful book which you will love reading as much as your children do. 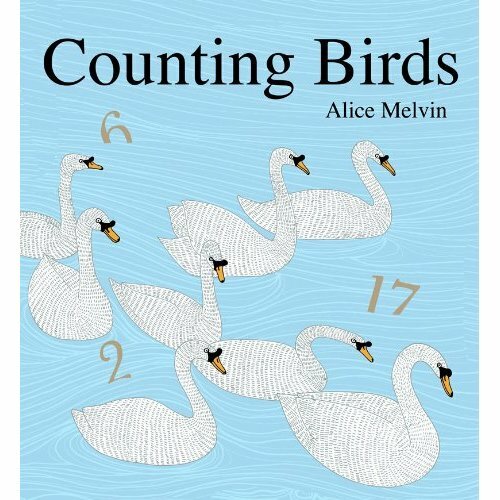 Counting Birds RRP Â£8.99, Â£5.84 from Amazon.